Tennis's fourth LP adds nuance, definition, and depth to their already well-established sound. By now, most have probably already formed an opinion of husband-and-wife duo Tennis and their light, sunny brand of indie pop. The band has a signature style that is either cloyingly cute or refreshingly summery depending on the listener. We first became acquainted with Alaina Moore and Patrick Riley on 2011's Cape Dory, which chronicled the pair's seven-month voyage aboard a sailboat. Now, in preparation for Yours Conditionally, Moore and Riley yet again embarked on an aquatic journey, this time to the Sea of Cortez. The purpose of the excursion was to mine their creativity and "revisit our past to salvage the present", as Moore writes in a press release. They composed about half of the new record prior to their voyage, and the other half at sea. If Yours Conditionally wasn't packed with such tightly constructed, compelling pop songs, this could all be a bit infuriating. You can't pull the same cutesy gimmick to sell two different albums, one might say. And indeed, if Tennis's latest effort relied on the story of its nautical conception to be compelling, this would be a fair complaint. Fortunately, the songs themselves are content to reduce the autobiographical elements to mere footnotes, standing entirely on their own. Listening to the record, one can easily imagine how it might have been crafted amidst salty winds and hazy sunshine, but neither does it feel like an album simply about a vacation. The songwriting includes enough bite and introspection to balance out the band's easy, relaxed sound, allowing enough clouds to roll in to keep things interesting. Moore skillfully and subtly modulates her voice between soft, delicate coos and forceful, smokier growls, as on the melancholy opener, "In the Morning I'll Be Better". Her technique ensures that the album consistently feels dynamic. The tension between delicacy and toughness is in many ways the album's defining feature. Yours Conditionally is notable for Moore's considered examinations of gender dynamics, particularly the intersection of her need for autonomy and independence with the parallel desire for love and touch. The very title of the record emphasizes a leveraging of power, a refusal to submit to ownership. On "My Emotions Are Blinding", she interrogates the stereotype of women as "hysterical" and laments the "binary opposition" of gender roles. "Ladies Don't Play Guitar", which retains the duo's penchant for '70s music while inching closer to mellow disco than soft rock, is even more explicit in its rejection of patriarchal norms. "Try to build a legacy / That will not complicate the future of your own progeny," she spits sarcastically, taking down fragile masculinity and the injunction for women to always cede the spotlight to men. Equally affecting are the record's more vulnerable love songs. Moore frankly acknowledges the needs and desires that drive us to intimacy, even as entering into such relationships can trigger uncomfortable questions about power and dependence. "I really need you / What's the use living without?" she cries over the soft landscape of "Field of Love". At times, these less robust numbers veer toward pleasant but nondescript territory, a persistent problem for Tennis. However, the duo mostly makes up for it with tracks like "Modern Woman", which is among the loveliest offerings here. The stripped down number is a simmering admission of our simplest but most potent desires. "All I want is comfort in a touch or a look", Moore sings in a gorgeous, desperate, late-night croon, taking on a power ballad-worthy melody with impeccable restraint and delicacy. 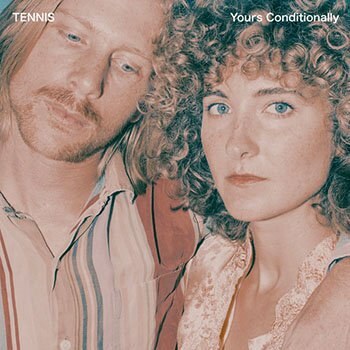 Yours Conditionally makes no attempt to reinvent Tennis and suffers from the same flaws that have mired much of their music, namely a tendency toward pleasant predictability. While the album is largely content to reside in familiar, unchallenging territory, however, it is also a lean and well-crafted set of pop songs with more bite than it lets on. It remains a largely satisfying venture that adds nuance, definition, and depth to the band's already well-established sound.